Keep the windmill blocks till the end of the level, because you ‘ll need them there to rescue the pets. 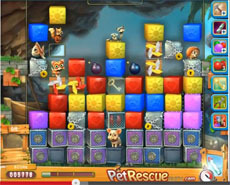 The two last lines of the level consists of wired blocks and two metal boxes that prevent pets’ rescueing. Use the windmill blocks, and maybe a bomb, there to break the wires and “drive” the key and the line blaster, as well, there is in the middle of the screen to the bottom to destoy with it the metal boxes. Now is the time to use the rest of the windmill blocks in order to rescue all the pets, by clearing the blocks under them. Watch the following video in order to complete pet rescue level 368, without boosters or hammers.